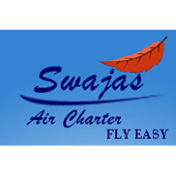 Swajas Air Charters, Non-Scheduled Airline Operator, initial public offer (IPO) subscription remained 0.01 times till 1600 hrs on Tuesday, October 4, 2011. As per the data available with the NSE, total bid of 56640 shares were received for the issue of 4464286 shares, 21240 bids were received at the cut-off price. The company is planning to raise Rs 37.50 crore, through this IPO, however, the book running lead manager --Aryaman Financial Services has revised the price band from Rs 90 - Rs 100 to Rs 84 - Rs 90. The issue closes on October 05, 2011. Cameo Corporate Services is the registrar to the issue.